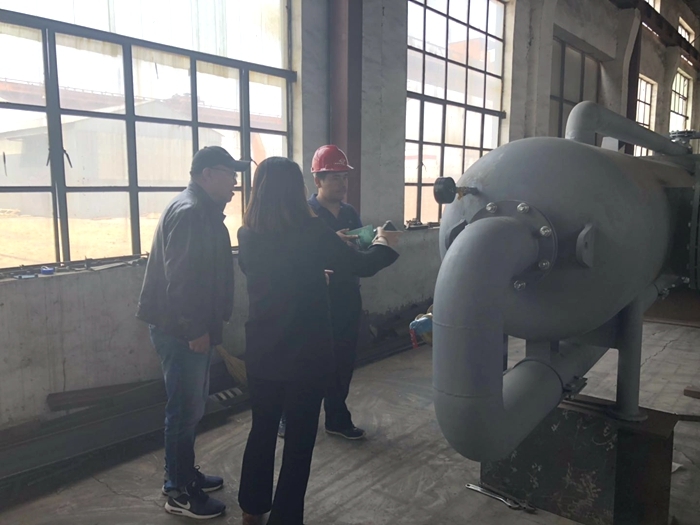 Yesterday, the clients from Indonesia got to our factory to check the mud gas separator and are very satisfied with the quality and delivery time. This is the first time to cooperate with this clients who is a trade company in Indonesia. 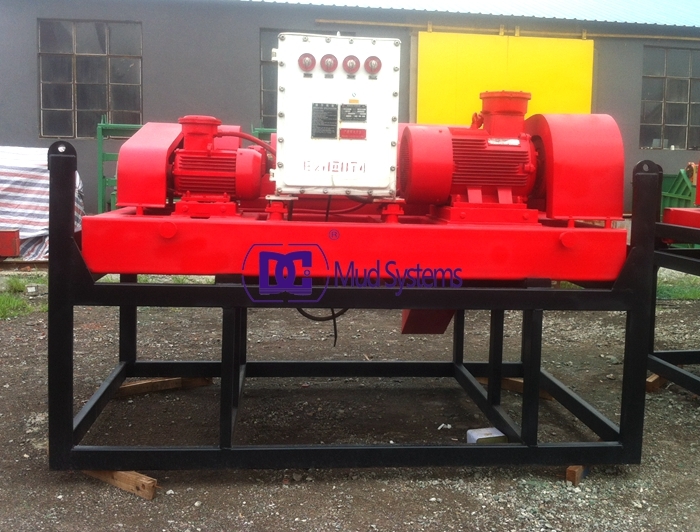 The Mud Gas Separator has been designed to capture and separate large volume of free gases within the drilling fluid. Designed for high pressure wells, this unit control the circulated gas to the surface separating the gas from the mud and vent it. DCZYQ series Mud gas separator(Poor Boy Degasser) is professional equipment to treat the gas invade mud. When the drilling mud result gas invade, the proportion of its weight and viscosity have a greater deviation not to meet the requirements of drilling. The serious situation is that would cause Chung well, and even blowout accident occurred, if not to treat it timely. ZYQ series Mud gas Separator combined with the Electric Ignition Device can be used to ensure the drilling process smooth. 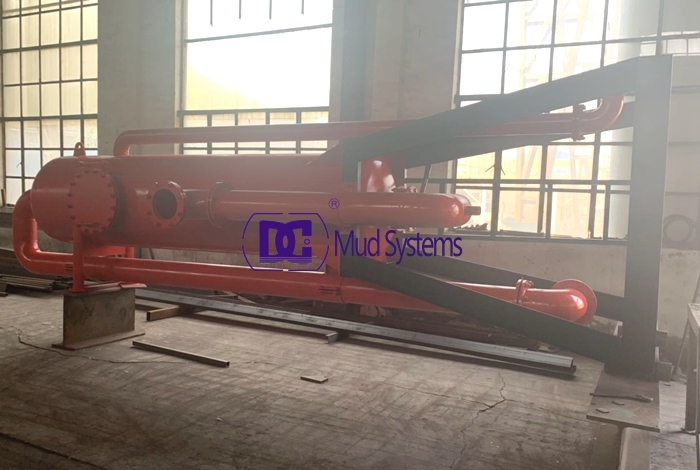 It is divided into the normal pressure Mud gas separator and pressure auto-control Mud gas separator, according to the pressure.Mud gas Separator is your best choice to prevent drilling mud invasion. Centrifugal pumps (SB sand pumps) are designed and engineered to handle abrasive, viscous and corrosive drilling fluids or industrial slurry. They have been proved and being in operation on land and offshore drilling rigs around the world. Please contact us for more details in order to make you customized. 3. The SB series shaft has a greater diameter to provide heavy-duty performance with minimal shaft deflection. 4. Bearings are designed for easy maintenance. 5. Stuffing box cover combines the functions of wear plate and stuffing box into a one-piece replacement unit. 1. Drilling mud mixing and shearing operations. 2. Feeding pump for desander and desilter. 4. Supercharging, mud cooling towers, wash down. 5. Chemical, refinery, industrial, construction and agricultural applications. Contact DC Solid control to get more information about the sand pumps. 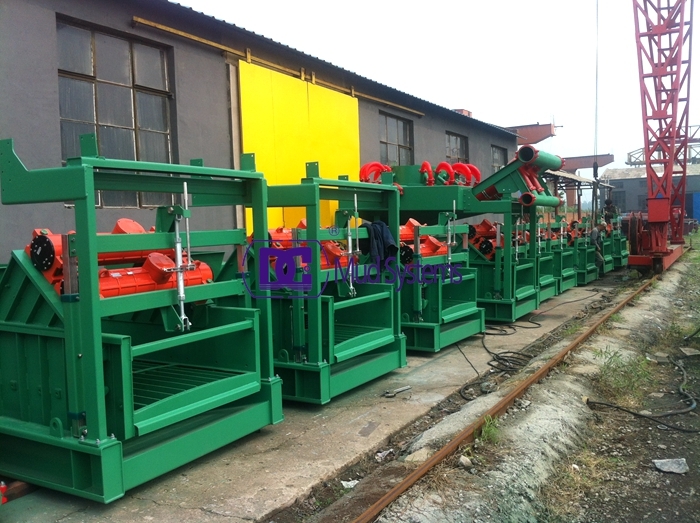 A shale shaker is the most commonly used device to separate drilled cuttings from the drilling fluid within oil well drilling. 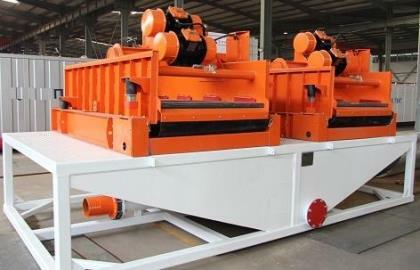 The separation capacity of a shale shaker screen is controlled by the shaker design, screen design and the imposed vibration frequency on the shale shaker. DC Solids Control is the professional and famous drilling fluids shale shaker manufacturer in China and can design and manufacture linear motion shale shaker and balanced elliptical shale shaker, VFD Shale Shaker, double-deck shale shaker and triplicate shale shaker for all onshore and off shore applications as clients’request. 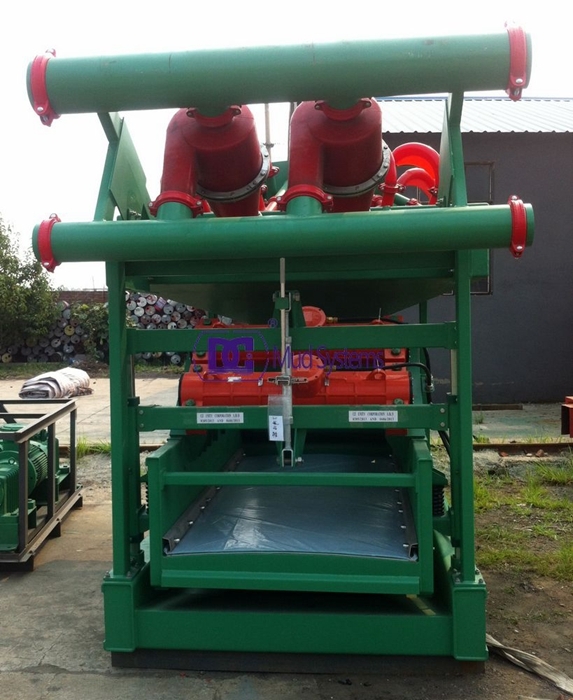 Please contact us to get more information about the drilling fluid shale shaker. DC mud agitators are designed to mix and suspend the solids using axial flow, promoting low particle size degradation and effective polymer shear. 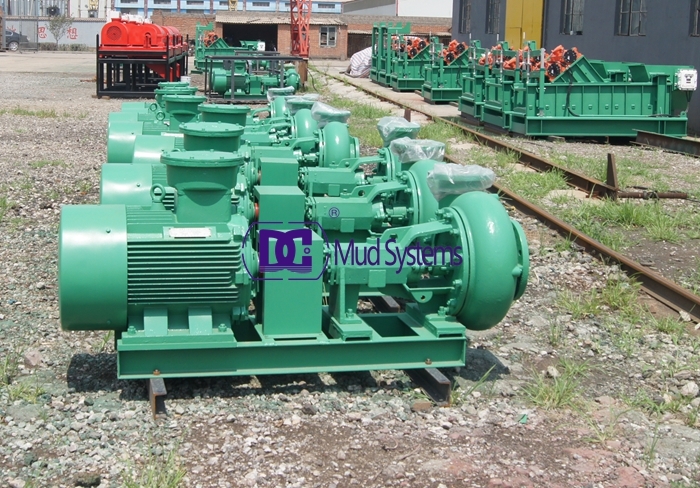 DCJBQ mud agitator is relatively a low energy device, easy to operate and inexpensive to maintain. 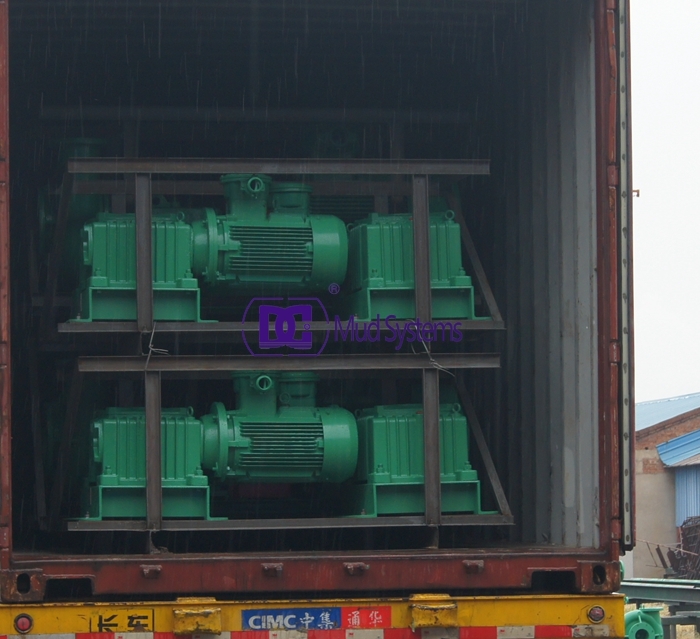 Yesterday, DC Solid control shipped 20 sets JBQ15 mud agitator shipped to Pakistan and is a tender project. 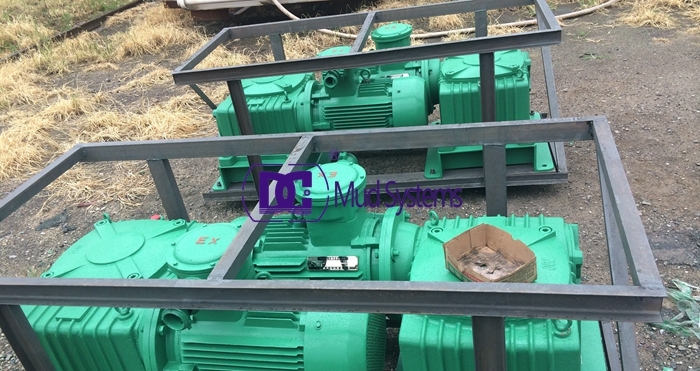 Our mud agitators include an explosion-proof, “C” faced motor, reduction gearbox (helical-bevel gears for horizontal agitators or all helical gears for vertical units), impeller, and shaft with assembly bushings. 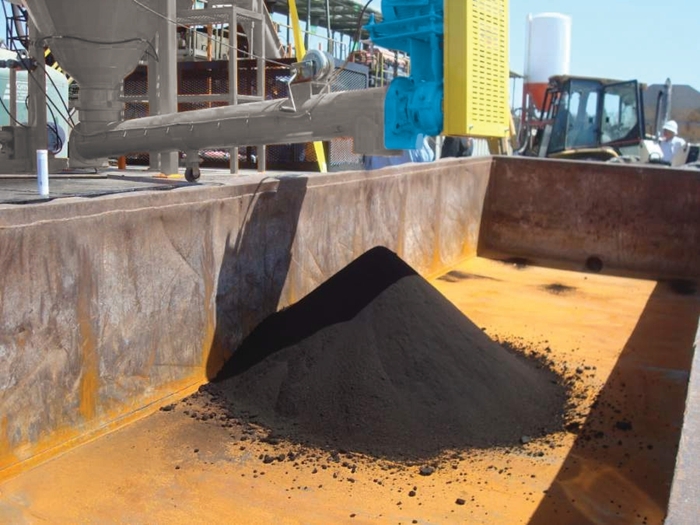 Shale shakers remove large solids (typically larger than 75 microns) from drilling fluid. (Drilling fluid is also known as drilling mud due to its turbid appearance.) Drilling fluids lubricate and cool the drill bit and are therefore integral to any drilling process. Because fluids are expensive to produce, shale shakers improve a rig’s economy by stripping away cuttings for disposal before recycling the fluid. Shale shakers are intensive vibrating devices. At the first stage of mud separation, they utilize a motor to generate vibrations. 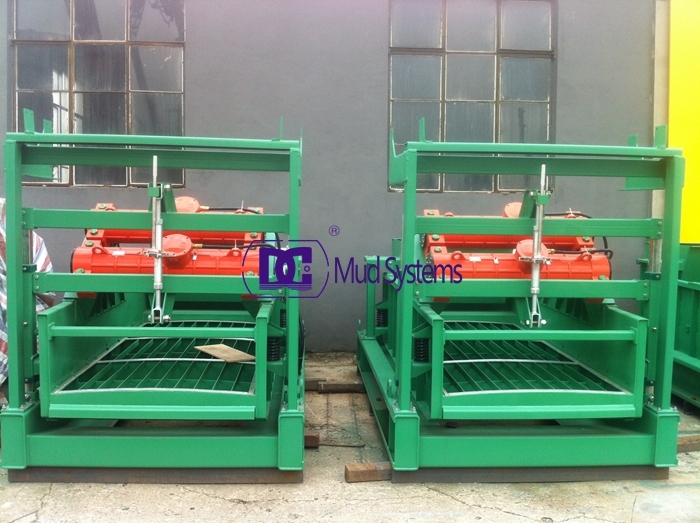 Acting as a sieve, the vibrating action pushes the drilling mud through a wire cloth screen. Drilling mud that filters through the shaker screen is moved into a mud tank for additional processing if necessary. Larger solids pass over the screen surface and are discharged for later collection and disposal. Linear motion shale shakers represent the newest shaker technology and are the most common approach to solids control in the oil and gas drilling industries. They produce linear motion via a pair of eccentric shafts rotating in opposite directions. Linear motion provides superior cuttings conveyance and is able to operate at an uphill slope to provide improved liquid retention. Shale shakers consist of vibrating sieves or screens which use force to advance the filtered mud through to the mud tank. During operation the inclination of the screen varies proportional to the flow rate of mud. DC Solid control can offer complete line of HDD & Trenchless Mud System including mud tank and equipment mounted on mud tank. All of Our solids control system is explosion-proof, anti-corrosion and leakage proof. The electric apparatus is DIIBT4 explosion proof, while the motor is out-of-door explosion proof motor. 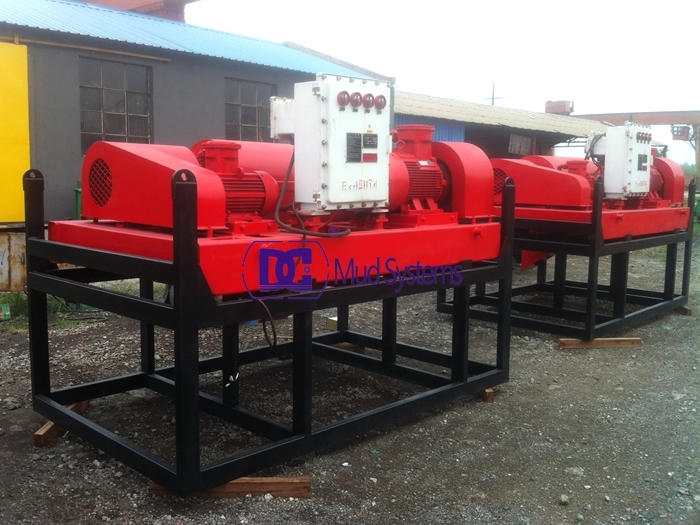 Centrifuge used in well drilling mud solids control is decanter centrifuge, also referred as decanting centrifuge. It is rather popular with drilling contractors or fluids service company. Strictly speaking, centrifuge is the 5th purification or cleaning equipment for drilling fluid. It is set after desilter cone or mud cleaner. It is mainly used to separate solids sized 2~7 microns. Decanter centrifuge including low speed, middle speed and high speed one. Different speed will produce different centrifugal force, treating capacity, and separation point. Centrifuge consists of scroll conveyor, drum, motor, differential, inlet port, discharge port, solid discard port, and so on. Decanter centrifuge will be fed by submersible slurry pump or screw pump with drilling fluid for finer separation of solid. 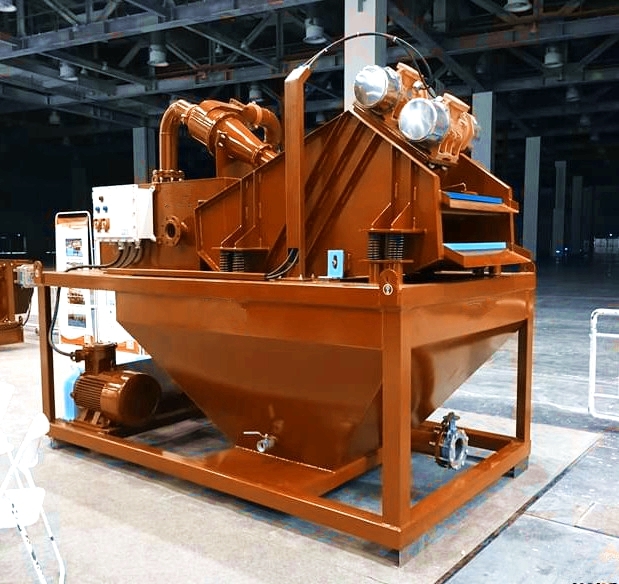 The material feeding into the inlet port, under centrifugal force generated by drum and scroll conveyor rotation, the solid will be dried and discharged via solids discard port. We know, on the centrifuge bowl or drum there are liquid zone and drying zone. 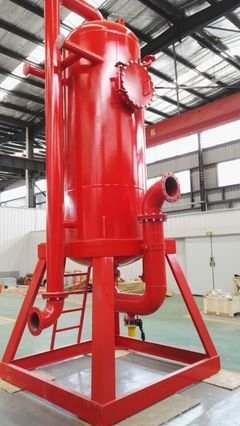 Cleaned drilling fluids will flow out centrifuge via the clean liquid effluent at liquid zone end. If you are looking for an oilfield decanter centrifuge that is highly effective and affordable, please browse our products. We offer a range of centrifuges of different sizes and capabilities that give you the exact results you need at a price that you can afford. 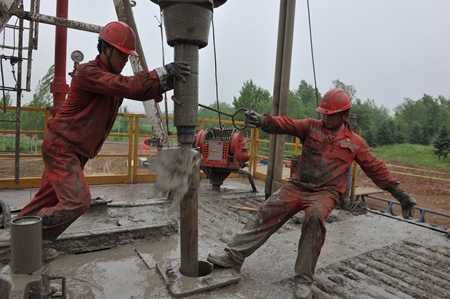 The well-drilling process generates two types of wastes — used drilling fluids and drill cuttings. Drilling fluids (or muds) are used to aid the drilling process. Muds are circulated through the drill bit to lubricate the bit and to aid in carrying the ground-up rock particles (drill cuttings) to the surface, where the muds and cuttings are separated by mechanical means. Most onshore wells are drilled with water-based or oil-based muds, while offshore wells may also use synthetic-based muds. A closed-loop drilling fluid system uses a series of storage tanks and solids control equipment to remove drill cuttings from the drilling fluid once it has carried them out of the wellbore during the drilling process. By removing these cuttings quickly and efficiently, an operator can increase the life of the drilling fluid and minimize waste, both of which have a significant impact on overall drilling costs. DC closed-loop drilling fluid system also called modular drilling waste management units are small packages of different function for drilling waste management. 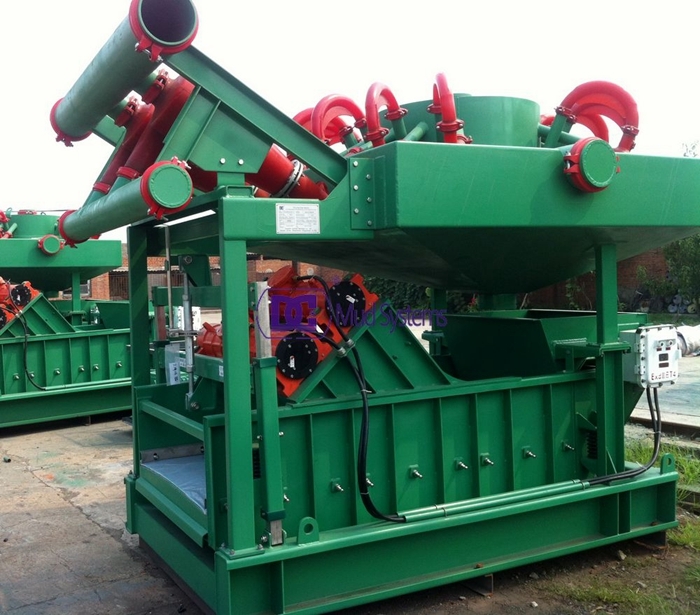 The modular waste management equipment include drilling cuttings transfer unit, high G dryer shaker unit, waste mud transfer unit, packaged skid mounted vertical cuttings dryer, and decanter centrifuge with telescopic skid, and drilling waste container. All of DC solid control equipment is modular and self-contained, allowing for rapid rig-up, reduced costs, and a small footprint. Our highly experienced engineering staff will work to ensure that every project has a tailored solution to maximize fluids recovery, minimize waste, and fit your budget.